Dutch police have released 30 Greenpeace activists in a port in the Netherlands after they were arrested for blocking the jack-up rig Saturn, commissioned by Gazprom for oil drilling in the Arctic. 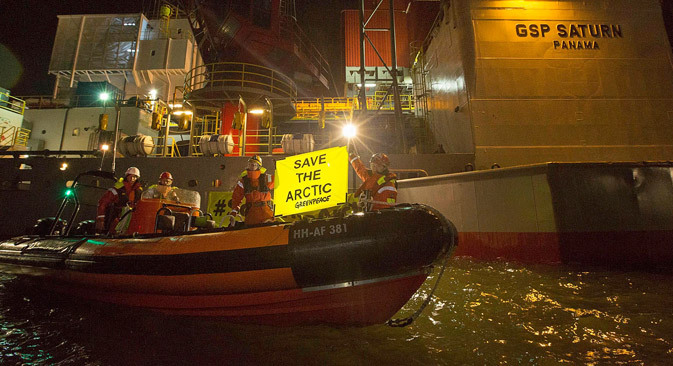 Greenpeace say that the platform is not fit for working in the Arctic environment. Dutch police have freed 30 Greenpeace activists after they were arrested for blocking the jack-up rig Saturn at a port in the Netherlands, hired by Gazprom Neft to do the drilling at the Dolginskoye oil field in the Pechora Sea. Greenpeace's Arctic program chief Vladimir Chuprov told Interfax that “…the police had detained all activists taking part in the action on the platform." He said this platform had been selected for the action because it was not fit for Arctic conditions. "The platform is not fit for working in the Arctic environment. It is of the same design as the Kola rig," Chuprov said. The Saturn belongs to Romania's Grup Servicii Petroliere (GSP). According to Gazprom Neft, drilling at the Dolginskoye field with the use of this platform is to begin in the ice-free period in 2014. Reports said earlier that divers used chains to contain the platform's supports and to immobilize it. Other activists climbed up to the platform and unfurled a banner reading: "Save the Arctic!" It was not the only action protesting oil extraction in the Arctic which Greenpeace held on May 27. Early on Tuesday, the activists paralyzed the work of the Transocean Spitsbergen platform in the Norwegian sector of the Barents Sea, which is licensed by Statoil. Greenpeace's ship Esperanza stopped exactly at the point where drilling was to begin. Ten activists dropped inflatable boats, reached the drilling rig, boarded it and blocked it," Chuprov said. The action at the Transocean Spitsbergen drilling rig is continuing," he added. "Such actions are the only instrument at Greenpeace's disposal to convey the message that drilling on the shelf is dangerous and economically senseless," he said, adding that instead of developing the shelf, oil companies should increase extraction at traditional fields and develop methods of extracting tight (shale) oil. Earlier, the Greenpeace activists managed to attract the attention of the world’s media in September 2013 when they tried to climb onto the Gazprom's Prirazlomnaya rig in the Pechora Sea. The international crew of the Greenpeace ship was arrested by Russian services in Murmansk, and a criminal case on piracy was opened against all the members of the crew. Three months later, a Russian court granted amnesty to all of the environmentalists. Activists have declared that oil production in the Arctic shelf is dangerous for the environment and poses grave risks to the economy. Greenpeace activists claimed that the action was peaceful.